A unique book that just looks so fantastic! M and I feel in love with this book the minute we opened the first page as it is not your bog standard turn a page book. Oh no. 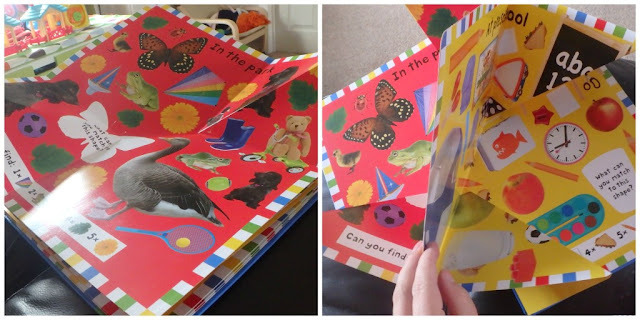 This is a open the book and see it expand before your eyes book which makes it an incredibly eye catching and mesmerising book for any little one (and I will admit that I enjoyed playing with it too). This fold-out book is all about interaction, with each fold out page featuring a number of items for your toddler to find. 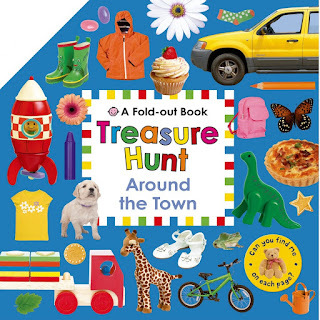 Each treasure hunt helps your child to recognise items, learn to count and just generally point at items in the book. It means you can have great fun talking with your child whilst they have fun learning about different things. Each fold out page has loads of things to discuss on it. Can you see the pink dinosaur? Where is the red apple? Can you find five raspberries? What items can you find that matched this shape? As with every Priddy Books publication this book uses lots of bold, vibrant colours that really catch the eye of a youngster. The images of the items needing to be found on each page are really clear photographs which just stand out from the page so much. This is a brilliant book for parents and children to own and we will be seeking out other books from the same range. We were lucky enough to be sent these books for free but all opinion within this review is mine and mine alone! There is simply nothing better than a book with a hidden surprise. As we age it has to be the twists and turns of a good novel but when you are little it can be fold out, flap lifting fun all the way - it is almost a shame for adults! i think Prue said it all; what a shame for adults we don't have books like this! But we do have novels :) this book looks great, I'll look out for it!